When I was young I liked to read, and to watch TV, and didn’t go out much, except alone to explore arroyos, watch movies, or go jogging very early in the morning, when the light was still gray. Going out jogging, it’s right on the surface of my memory how the air tasted, like an apple, and the way the sidewalk curbs looked in that light, gray on gray, appearing out of the mist like phantom tracks. If it had been raining, there’d be sounds, the splish-gerr-splish of some unseen tires driving through a puddle. Back at home we still have an old pinon tree that you could climb up, and then on to the roof. On weekend afternoons my activity was to ride my bike to the store, and rent a movie to watch at home. My favorites were “Journey to the Center of the Earth” with James Mason, and “The Golden Voyage of Sinbad” with the old Ray Harryhausen monsters. Later the grocery store put a Ms. Pac-Man arcade game in the back storeroom. The nearby 7-Eleven had Tempest (awesome) and Centipede (slightly less awesome), thus in the shopping district of my own small town forming the classic arcade triumvirate that makes me feel truly special because, I was there. I had a long blister on the side of my hand from using it like a blade with the dial controller, gaining precision and more speed than possible just by turning it with my fingers. Later someone figured out how to pry open the front panel near the Insert Coin slots, so you could click a small red button inside to increase number of games left on the digital counter. Once you could insert your quarter without that delicious frisson of fear — will it be worth it? Will I ride out this quarter, or will it be wasted on some stupid slip on the first alien attack wave? — the fun was spoiled, and once the summer moment was gone and you could play endlessly for free, it was impossible to recall why it was ever fun in the first place. I loved board games, but had trouble getting anyone to play. My personality seemed dull to myself, and to lack sparkling qualities. I framed my analysis of the structure and meaning of a game in terms of how to win, and didn’t understand the point of playing otherwise. Sometimes I would say something, or examine flowers or things people left in the street, and people would snort or snicker, or look worried or irritated. My sister was popular and had close friends, but I was too much of an accountant, with friendship owed and due, to be very much fun for anyone. Or maybe it was because I was really different than everyone I knew, invisibly at first, then for certain when I lived in as the only girl insei in Korea, without the ability to speak Korean. Even though the purpose of being there was to play a board game, I still couldn’t get anyone to play very often, because I was one of the least skilled there. We really can do almost anything. I can see how and why, but also where it is all going. We will all lose in the end, and go to the great review in the sky. The other day my son said that they’ve made big steps in plastification and we may be able to live forever, and I’m thinking about that digital counter in the arcade and the air that tastes like apples and the pinon tree and I find myself hoping we both die too soon to be made into plastic. I’m just looking for another summer moment. Seems like go is our best chance. 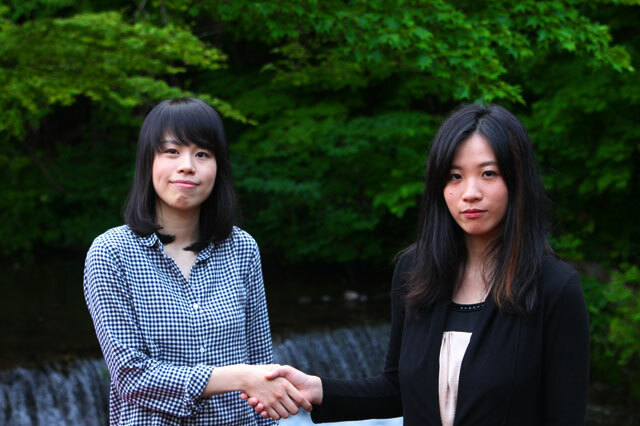 Aizu Central Hospital Cup: Xie Yimin (right), Women’s Meijin, will meet O Keii 2P (left), the daughter of O Rissei 9P, in the final of the 2nd Aizu Central Hospital Cup. In the semifinals, played on June 7, Xie (W) beat the previous winner Fujisawa Rina 2P by resignation and O (B) beat Kato Keiko 6P by 4.5 points. The final, the only two-day game in women’s go, will be held on July 2 and 3. China wins 4th Mt. Tiantai Nongshang Bank Cup: The 4th Mt. Tiantai Nongshang Bank Cup World Women’s Team Championship was held in Taizhou City, Zhejiang Province in China from May 8 to 10. 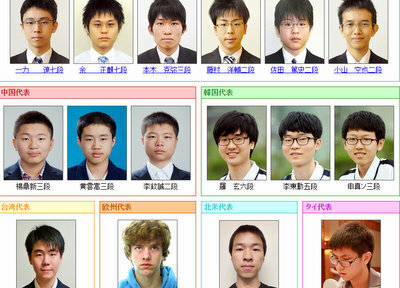 Three-player teams from China, Korea, Japan, and Chinese Taipei competed. The teams finished in the order just given. Representing Japan were Fujisawa Rina 2P, Xie Yimin 6P, and Kaneko Maki 1P. Results are given below. (Round 1) China beat Japan 3-1; Korea beat Chinese Taipei 3-0. (Round 2) Japan beat Chinese Taipei 3-0; China beat Korea 2-1. (Round 3) Korea beat Japan 3-0; China beat Chinese Taipei 3-0. So Yokoku 9P accompanied the Japanese team as coach. A conversation he had with the top board for China, Yu Zhiying 5P, gives an idea of what goes into becoming a top player. As a member of the national team, Yu studies at the Chinese Qiyuan from 9 to 5, Monday to Friday. At night, she plays Net games, with her norm being 3.5 games a night. Even on days when she has official games, she still completes her norm. She said she plays about 1,700 games a year. So commented that Fujisawa and Xie are also studying hard. In an interview with the Chinese press, Fujisawa said that she studies eight to ten hours a day, at least six days a week. The other members of the Chinese team were Song Rongrui 5P and Rui Naiwei 9P. The Korean players were Choe Cheong 5P, Kim Hye-min 7P, and Pak Ji-yon 3P. 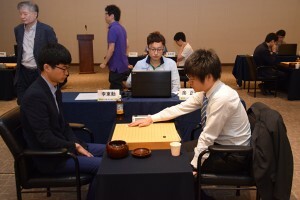 Choe inflicted the sole loss suffered by China, defeating Yu on the top board. 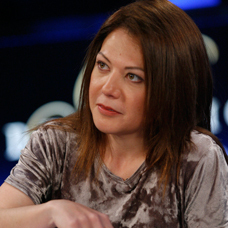 As of May, Choe was the top-ranked woman player in the world (#193 on the geocities site). Yo Seiki wins Okage Cup: The O-kage (gratitude) Cup is sponsored by a group of tourism-related shops in the street leading to Ise Shrine. It is open to players 30 and under and so far has been won by Cho Riyu (2010), Anzai Nobuaki (2011 and 2012), and Ichiriki Ryo (2013 and 2014). This year, the main tournament (for the best 16) was held in Ise City on May 14 And 15. 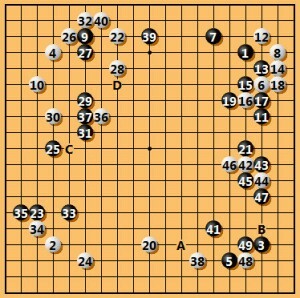 In the final, Yo Seiki 7P of the Kansai Ki-in (W) beat Ichiriki by resignation. Hane senior wins 1,200 games: On May 21, Hane Yasumasa 9P became the sixth player at the Nihon Ki-in to reach the landmark of 1,200 wins. It took him 57 years one month (he will turn 71 on June 25). With 641 losses and 5 jigos, his winning percentage is 65.2. He won the Oza title in 1990. He is the father of Hane Naoki. 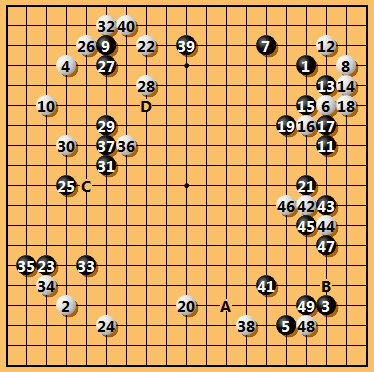 Lead changes in 40th Meijin League: A game in the 40th Meijin League was played on a Monday, May 4, instead of the usual Thursday. 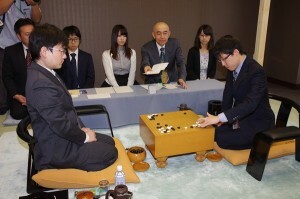 Cho U 9P (B) beat Murakawa Daisuke Oza by 2.5 points, thus scoring what was only his second win in five games. Murakawa dropped to 3-3 and will probably have to focus on keeping his league place rather than on becoming the challenger. An important game was played on May 7 between the two players who were close on the heels of the provisional leader of the league, Ko Iso 8P. Kono Rin 9P (B) beat Yamashita Keigo 9P by resig. 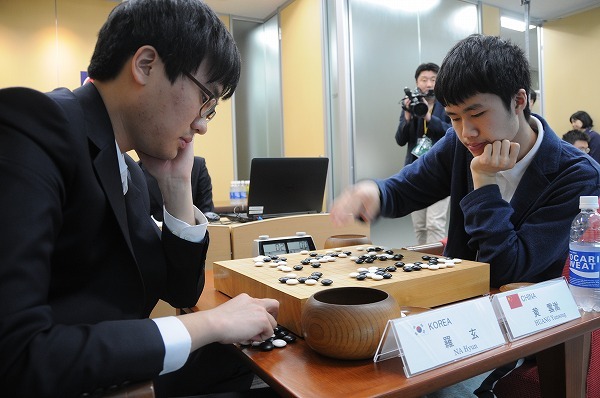 Kono (right) improved his score to 4-1 and shares the lead with Ko. Yamashita dropped to 3-2. 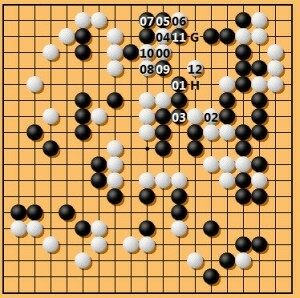 On May 21, Takao (W) beat Ko Iso by resig. This completed the sixth round. The lead is now shared by Kono and Takao, who are both on 4-1. 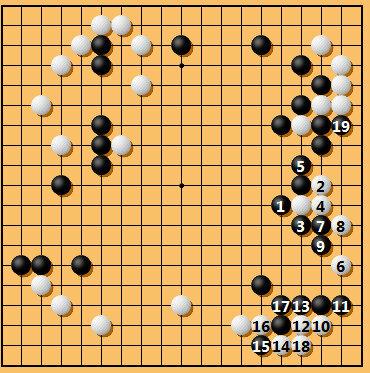 For the first time since the league began, Ko Iso has dropped out the lead or a share of it, but on 4-2 he is well placed if the above two falter; he hasn’t played either of them yet, so he doesn’t have to rely on other players to drag them down. Yamashita is next on 3-2. Kisei S League starts: The S League is at the top of the pyramid of five leagues in the revamped Kisei tournament, and its winner has the best chance of becoming the Kisei challenger, as he gets a seat in the play-off and an automatic one-game lead as well. The first two games were played on May 7. Murakawa Daisuke Oza (left) started the week badly (see Meijin League report above), but did better here. Playing white, he beat Takao Shinji by 4.5 points. 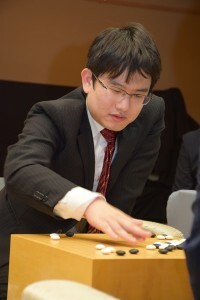 In the other game, Yoda Norimoto 9P (B) beat Kobayashi Satoru 9P by resig. The other players in the six-man league are Yamashita Keigo and Yamashiro Hiroshi. I was planning to report in detail only on the S League, but there was an interesting game in the A League on the 4th. Veteran player Kono Rin 9P (W) beat the up-and-coming new star Ichiriki Ryo 7P by resignation. 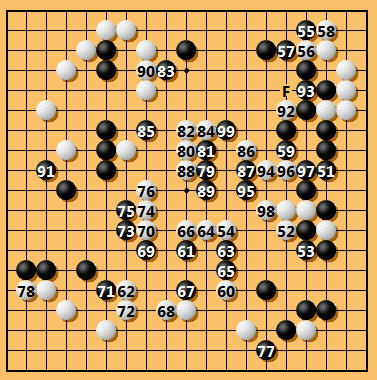 On 2-0, Kono shares the lead in the eight-player A League with Cho Riyu 8P. Cho U moves to Taiwan: Cho U 9P has revealed that he is moving to his homeland of Taiwan this month, though he will remain a member of the Nihon Ki-in and keep playing in Japanese tournaments. The reason is his dissatisfaction with his results in recent years; he is hoping that a change in environment will bring about an improvement in his play. Many top players have come to Japan from Taiwan (Rin Kaiho, O Rissei, and O Meien, just to mention three), but this is the first time a top player has taken the reverse course. Cho is 35, an age at which even a top player usually sees a falling off in his results, but Cho is obviously not prepared to accept this. His inspiration may be Cho Chikun, who won his second triple crown (Kisei, Meijin, and Honinbo) at the age of 40. 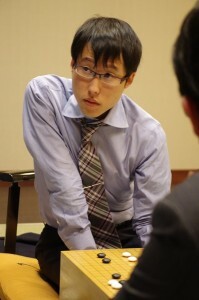 Cho U came to Japan at the age of ten and in 2009 became the first player to hold five top-seven titles simultaneously. He has seats in the top three leagues (though in the A League in the 40th Kisei, not the top S League), but he hasn’t won a title since losing the Kisei title in 2013. In an interview in the Yomiuri Newspaper, he said: ‘I can’t show [go fans] games of which I am ashamed. I think that changing my environment will have a positive effect on my go.’ A brief news item in Go Weekly stated that Kobayashi Izumi was taking a break from tournament play after her game on May 14 so that her children could study in Taiwan. Cho’s desire to see his children master Chinese is obviously an additional motive for moving back to Taiwan. It’s a bit unfortunate that Kobayashi Izumi (aged 37), who just made a comeback to active play last year, once again has to sacrifice her own career for her family. Yamashita to challenge Iyama Gosei: Yamashita Keigo is doing his level best to make a breach in Iyama’s quadruple-crown citadel. In the play-off to decide the challenger for the 40th Gosei title, held at the Nihon Ki-in in Ichigaya, Tokyo on May 18, Yamashita (W) beat Kono Rin 9P by resignation. The game lasted 194 moves. Yamashita has won the Gosei title once, way back in 2000 (the 20th Gosei); in 2008 he unsuccessfully challenged Cho U, losing 1-3. This will be the third title match this year between Yamashita and Iyama; it is only the third time two players have played three top-seven matches against each other in the same year. Moreover, the Gosei is only the fourth title match of the year, so the two could well set a new record (Yamashita is still in the running to become the challenger in the Meijin and Tengen tournaments). The first game of the title match will be played on June 26. Click here for the SGF. It was no surprise that Na Hyun made the final of this tournament for players under 20, as he is one of the top young players in Korea. 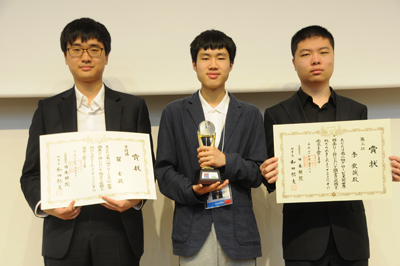 Among the Chinese players, one might have expected Yang Dingshin, rated 18th in the world, or Li Qincheng, who won the CCTV Cup, a TV tournament like Japan’s NHK Cup, last year, but Huang proved to be a dark horse. Actually, at 18 he is two years older than the other two Chinese representatives, so you could say he pulled rank. The following commentary is an amplified version of the report in Go Weekly of the public commentary conducted by O Meien, with Mannami Nao 3P acting as his assistant. The opening, with Black ignoring 8 to switch to the approach move of 9, is very popular these days. There are many examples of it from actual play. The same opening appeared in the play-off for third place. White 36. White thinks that the exchange for 37 will make 36 a forcing move when he attaches across the knight’s move with C.
White 54 is a good, calm move. O: “Moves like this reflect the player’s experience. “ At first, O had thought that the result to 52 was not interesting for White, but he started to revise his opinion on seeing 54 on the grounds that Huang was obviously satisfied and we could rely on his perception. White 60 is another calm move. Having played a forcing sequence on the right side, White believes that this is good enough. O commented at first that he couldn’t play 60, but White 62 convinced him that Huang knew what he was doing. It turned out later that both the players agreed that the game was good for White at this point. That’s why Black plays 61: he has to harass White’s sole weak group to get back into the game. When White ignores 61, 63 looks like the natural follow-up, but the players agreed later that attaching at 65 instead would have made the game more difficult. White’s solid extension of 64 works well. O: “This may have been the decisive point of the game.” That’s not to say that’s it’s a won game for White by any means, but he has an edge. Black 77, forestalling White E, is big, but so is White 78. Black 79 is an all-out move that clearly shows that Black feels he is behind. O commented that it may have been an overplay. It immediately struck O as being too deep. White 84. If White answers the peep at 90, Black intends to push down with 84, so countering with 84 is natural. The cut of White 92 is a good move. If Black answers at 97, White has the threat of F, so Black goes all out with 93. Black 99 extricates the center stones. If White cuts at 103, Black cuts at 102 and at this point Black is ahead in the capturing race. When White plays 100, however, Black has no choice but to reinforce at 103. 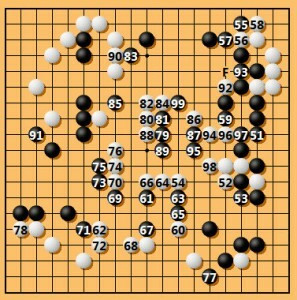 White 112 is the knock-out punch: it makes miai of G and H, so Black has to resign. During his commentary, O commented that the strength of the top young Chinese and Korean players came from a mixture of reading ability and perception. Incidentally, the day of the final was the first day that Huang wore a jacket instead of just a jersey. O commented that in China go is regarded as a sport, so the young players all wear jerseys. Often their training camps are held at the same venues as soccer training camps, so the players would feel funny if they dressed differently. O joked that they switch to suits when they turn 30. During this tournament, Ichiriki and the other Japanese representatives were turned out in natty suits and ties. One advantage of the Japanese system that struck me, however, is that the Japanese players are “socialized” earlier than the Chinese players. It was hard to get a word out of the Chinese teenagers in interviews, but the Japanese teenagers were already adept at public speaking. During the reception on the Thursday, Mannami called them up on to the stage at different times for mini “talk shows” TV-style and they all acquitted themselves well.